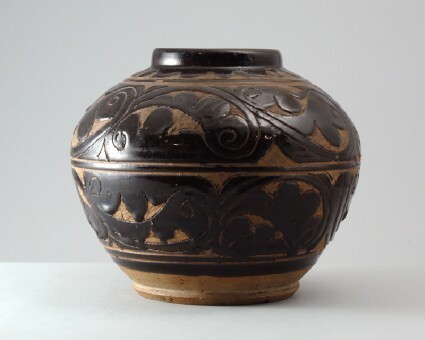 Jars of this type, made by kilns in Shanxi province, have been attributed both to the Jin (1115–1234) and Ming (1368–1644) dynasties. The globular jar is very heavily potted, with a low wide neck and a massive foot with low footring and chamfered edge. The piece is thickly covered inside and out with a dark glossy brownish-black glaze into which a large-scale design has been cut, to appear in reserve against the buff-coloured biscuit. The neck is surrounded by a narrow lappet border, and the body shows a nearly abstract design of stylized scrolling foliage, arranged in two broad bands. The lowest part of the sides, foot and base are free of glaze, the exposed body is very rough.